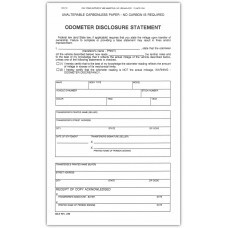 Odometer Disclosure Statements are used by auto dealerships to ensure that customers understand the odometer reading and to protect buyers from unethical practices of manipulating the odometer reading or lying about the true mileage of the vehicle. 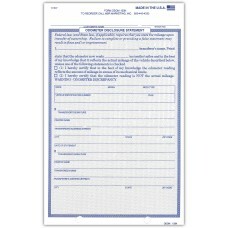 These forms are required to ensure your dealership is in compliance with federal law. We offer three different varieties of stock odometer disclosure statements for non-leased vehicles and one one form specifically for leased cars. Each of the forms serves the same purpose, to certify to the best of the dealer's knowledge that the reading on the odometer is accurate. If the dealership knows that the reading is not accurate, there is a space to indicate this as well. 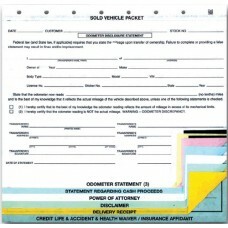 These forms serve to protect both the buyer and the seller of the vehicle. In addition to our standard odometer statements, we also offer the Sold Vehicle Combination Forms and the Trade In Vehicle Combination Forms. 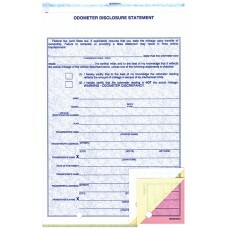 Both of these are multi-purpose, time saving forms that include odometer disclosure statements in addition to several other forms. 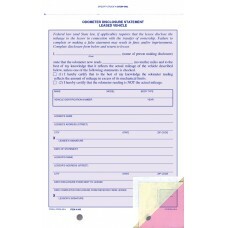 The Sold Vehicle Combination Forms include a 3-part odometer statement, statement regarding cash proceeds, power of attorney, disclaimer of warranties, delivery receipt, credit life & accident & health waver, and insurance affidavit. 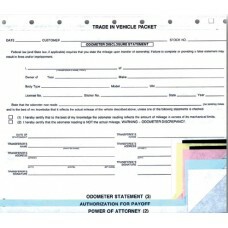 The Trade In Vehicle Combination Forms include a 3-part odometer statement, authorization for payoff, and a power of attorney. Regardless of which form you choose, these odometer disclosure statements will serve to protect your dealership by ensuring you are in compliance with the federal mileage disclosure laws.